Replacement Clutch Assembly used on some Whirlpool, Admiral, Amana, Crosley, Estate, Inglis, Kenmore, KitchenAid, Magic Chef, Maytag and Roper brand washing machine models. 285785, AP3094537, 2670, 285331, 285380, 285422, 285540, 285761, 3350015, 3350114, 3350115, 3351342, 3351343, 387888, 388948, 388949, 3946794, 3946847, 3951311, 3951312, 62699, 63174, 63765, 64176, AH334641, EA334641, J27-662, LP326, PS334641. Like a car’s transmission, the clutch controls the movement in the tub’s agitator. Most washing machines use a clutch system to make the internal tub move during any stage of the washing process. 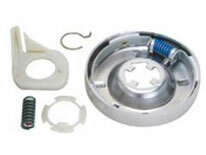 Includes brake cam driver, blue spring for large capacity washers, black spring for compact machines.